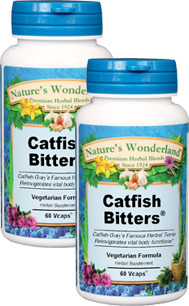 Catfish Bitters™ - 525 mg, 60 Vcaps™ each (Nature's Wonderland) - Penn Herb Co. Ltd.
Appalachian Tonic Invigorates, Strengthens & Cleanses! "I can't say enough about Catfish Bitters. I use it several times a year...in fact, it's the only capsule I take on a regular basis, why? Because it works!" K.P. PA. Many use this reinvigorating cleansing blend as a traditional "change of season" tonic. This legendary combination of herbs & roots was passed down to the late "Catfish" Gray "Man of the Woods", a fifth generation folk healer from the mountains of West Virginia. In fact, many would flock to see this colorful character and to obtain his superb blend of system-cleansing and strengthening herbs. Here at Penn Herb, we are pleased to carry on his healthful tradition. Experience The Legendary CATFISH BITTERS Defense For Yourself! Black Cohosh, Blood root, Burdock, Ginseng, Golden Seal Root, Lobelia, Peppermint, Pipsissewa, Queen Of The Meadow Root, Red Clover, Sarsaparilla, Slippery Elm, Solomon Seal Root, Spikenard, Wild Cherry Bark, Yarrow, Yellow Dock; Plant Cellulose -(Vcaps). Supports healthy liver function; detoxifies the system of excess toxins and mucus; reinvigorates digestive & circulatory health; immune health; respiratory health. As an addition to the daily diet, take 1 or 2 capsules 3 times daily with water at mealtimes. NOT TO BE USED DURING PREGNANCY OR WHILE NURSING.